A decade after his death, the visionary conceptual artist John Latham (1921–2006) remains a vital force and influence on contemporary art. His legacy is currently being celebrated across the United Kingdom in a trio of museum exhibitions, alongside a solo exhibition of his spray paintings at Lisson Gallery London (1 April - 7 May 2016). As part of its 50th anniversary celebration, Modern Art Oxford presents 'KALEIDOSCOPE', a year long series of interlinking exhibitions, performances and events reflecting on great moments in the museum's history. Two of the exhibitions in the series, 'The Indivisible Present' (6 February - 16 April) and 'A Moment of Grace' (16 April - 10 June), feature works by John Latham, including the artist's famous use of books – the keepers of all knowledge – into what the artist called skoob works (‘books’ spelt backwards). 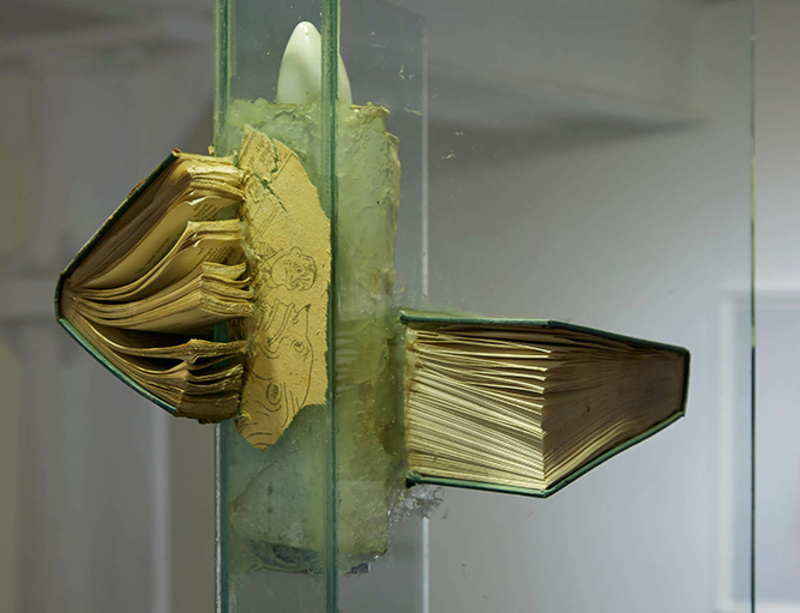 The sculptures of damaged books on view at Modern Art Oxford question assumptions of received knowledge as permanent and certain. In 1963, when Latham showed at Bear Lane Gallery, a predecessor of Modern Art Oxford, visitors protested at his ‘immoral’ destruction of books, which was a debate he had hoped to spark. Latham’s influence on contemporary art is further explored in the exhibition ‘A Lesson in Sculpture with John Latham’ at the Henry Moore Institute (24 March – 19 June), which presents his work in conversation with sixteen sculptures by artists working across the twentieth and twenty-first centuries. Participating artists include Bernard Aubertin, Marcel Broodthaers, Tony Cragg, Barry Flanagan, Mary Kelly, Yves Klein, Gordon Matta-Clark, Annea Lockwood, Josiah McElheny, Cornelia Parker, Katie Paterson, Michelangelo Pistoletto and Carey Young. A major survey at Tate Britain reveals conceptual art's lasting legacy and its evolution in Britain from 1964–1979. The exhibition, which runs from 12 April - 29 August, gathers together artists, including John Latham, who took art beyond its traditional boundaries to suggest new ways of engaging with the realities of the world beyond the studio, which ultimately led to a questioning of the function and social purpose of art. For more information on the exhibition, please click here.